Thanks for visiting! Here’s a brief background on who I am, and what this blog’s all about. I am a husband to a sweet and beautiful wife, a dad to three active kids, I have a honey do list and a day job, and I like quality coffee. The coffee consumption started in collage as a way of keeping my eyes open and my mind somewhat alert during all night study sessions. Coffee still provides an occasional boost to jump start my day. I enjoy it for the experience and the flavor now more than those early days. The quality of the coffee I enjoy has most notably improved. While the woodworking and home improvement projects took flight when my wife and I purchased our first home, the passion for the craft was planted many years earlier. I have fond memories of watching my grandfather build any number of creations in his workshop. 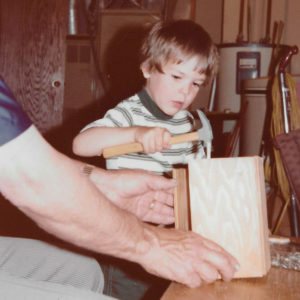 He gave me my first woodworking kit complete with perfectly sized hand saw and hammer when I was a young boy. When asked what I wanted to be when I grew up, the answer was “a carpenter” except for the days when I would answer firefighter. As it is, my day job centers around “Computer Stuff”, which I really enjoy. I find a special delight in knowing that all of my woodworking projects are for me. I run on my lunch breaks and on weekend mornings before the kids start the adventures of their days. In short: I run, I bike, I build, I love, I play, I pray, I grew up in Minnesota and in Iowa, and I live in Texas. Welcome to the blog – and thanks for reading!